I heard about this on Facebook and found a tutorial on it here. It's basically like zentangles but with arrows angles and straight lines thrown in. Great FMQ practice and using white fabric and black thread if you screw it up there is only minimal cost wasted (besides your time but then any practice is valuable, especially when you screw it up) lesson learned and all that. I thought I had pictures of my first attempts but I deleted them. Let's just say they were the screw ups learning experiences. Finally I felt confident and made a good one that I made into a journal cover. This is a pumpkin we made at work using things found around the housekeeping and maintenance departments. Hope you all have a Happy Halloween! 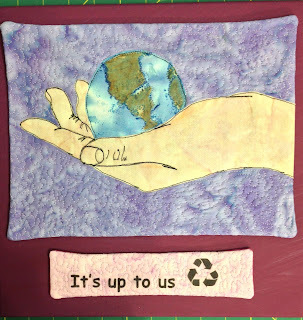 We must do something about all the crap we throw away in the trash. I think those plastic water bottles people buy should be banned as well as those plastic garbage bags that I do admit that I use because I forget a cloth bag although if they didn't have them at all I probablly would remember if it meant carrying by groceries to my car one at a time. And this lovely landscape - free of trash and debris - notice no trash bags floating in the water like in the ocean, killing all the fish? 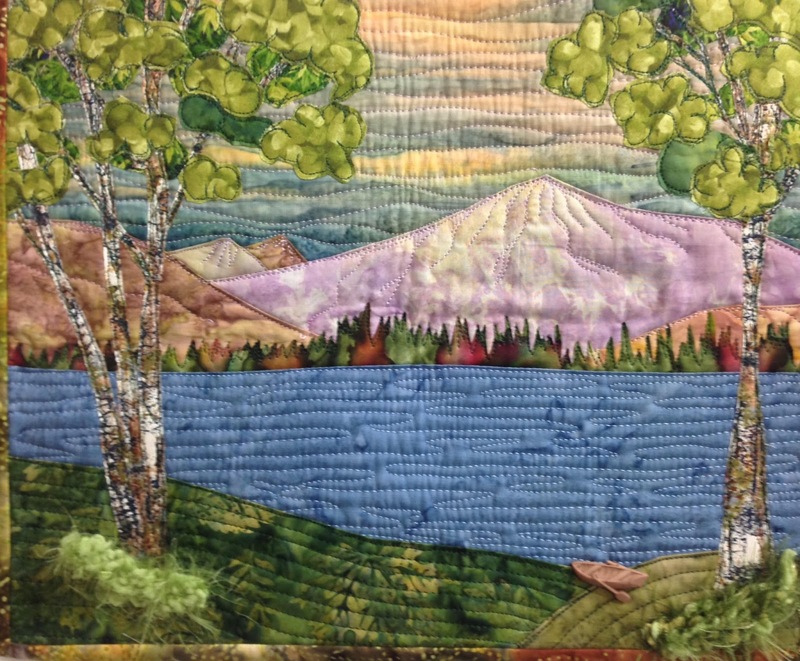 This one is about 14" x 12" - mountains and ground turned under and the rest fusible applique. The distant trees were leftover from another project already cut, the mirror image of whatever it was they were cut from. If it's got fusible on it, I always save the pieces as they can usually be used. The little canoe is a button and the bottom of the trees have a little yarn that I single crocheted to look like a bush. Very peaceful, don't cha think? Every once in awhile I feel the need to piece. As you know applique is my thing but sometimes a girl just has to sit and sew and sew and sew and sew. I came across this falling charms which uses charm packs (those cute little packages of matching prints cut 5" square). I have a couple that were gifted to me and they do make it easy to piece. 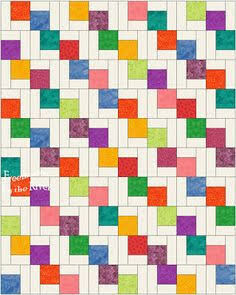 Missouri Quilt company has a tutorial if you are interested. even thouth this is sort of a no brainer, sewing wise it always helps to have layout so here it is. and if you this and really want to not have to think, when you put it together think for the light part and L and a 7. See, it's just L and 7 over and over - easy peasy! 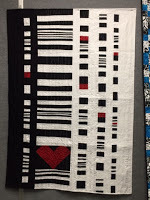 AND last but not least look at this beautiful modern quilt that my friend Glen from the famous Quilts and Dogs blog made and won an honorable mention for at her quilt guild. She even did the binding different colors where the black changes to white. She has a tutorial on how she did that here. I read it over quickly and she scared the begeesis out of me using the B (bias) word but I should really learn to do it. I'm working on 3 projects in different stages of completion. Only sneak peaks this week but I promise I will have at least two done by next week to show you. The back of a small landscape just sewing the binding on by hand. Love those clover clips! Another tiny one, and not sure where to go after that but will decide after the facing is on. A crow is outlines with black stitching and now I play with my inktense pencils. Haven't added any water or gel yet. It will be much darker but like to add color slowly. A lot of my time has been spent enjoying the last of the fall foliage and trying to keep up with my dogs. You don't see ZuZu because she runs around so much it's hard to get a photo. "Come on, let's move it!" Check my last two posts here and here for progress on this house quilt. I didn't end up using the painted cones. After adding the yarn, they just didn't go. Ended up with " pumpkin buttons"
I did use cut up driftwood for the fence posts, sewing them on by hand. This yarn bunch makes a nice flower bush. We are in peak foliage season right now here in Vermont. I hope you can get out and enjoy the last joys and beauty of fall this week end. I'm still working on the commissioned house quilt this week. I showed the starting of it last week. This is the photo she gave me. She said the house is more red than in the photo. From the photo I made the pattern - I showed you last week how I quilted the background first. Now I've added the house, a rail fence and a little guiding in the background. These elements are in another photo she gave me. 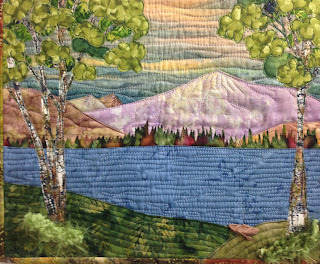 I have quilted the foreground grassy hill and am doing the binding next. She wants to add some 3-D "stuff" which is right up my alley so will play with that next. Don't they look like trees to you? Hopefully I can sew them on the quilt without them falling apart. Next week I will show the finish. 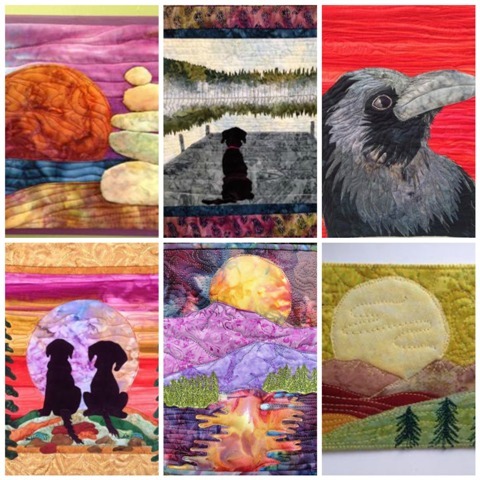 In the meantime I am off to waste spend some time at Keepsake Quilting - the free shipping no minimum draws me in every time. I love their Bali medleys.